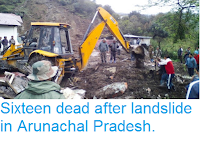 Sciency Thoughts: Fourteen feared dead after landslide in Arunachal Pradesh, India. 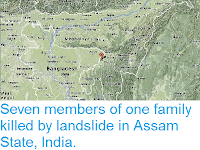 Fourteen feared dead after landslide in Arunachal Pradesh, India. 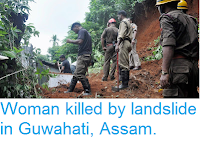 Fourteen people are feared to have died after a landslide hit a village in the Papum Pare District of Arunachal Pradesh State, India, on Tuesday 11 June 2017. 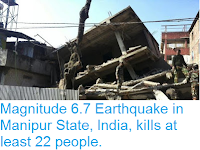 The event occurred at about 3.30 pm local time, and burried a number of houses in the village of Latap. 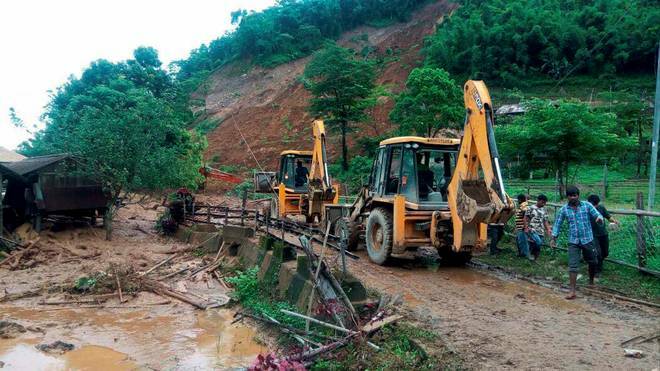 Fourteen people were found to be missing after the landslip, the bodies of five of whom have subsequently bee recovered. It is thought unlikely that any of the none remaining missing persons are still alive. Rescue operations in the village of Latap in Arunachal Pradesh on Tuesday 11 July 2017. Press Trust of India. The incident is reported to have happened after four days of continuous rain in the area, associated with the summer rainy season. Landslides are a common problem after severe weather, as excess pore water pressure can overcome cohesion in soil and sediments, allowing them to flow like liquids. Approximately 90% of all landslides are caused by heavy rainfall. Arunchal Pradesh has a rainy season that begins around the end of April or beginning of May and ends around September, bringing 2-4000 mm of rain to the region each year. تعلن شركة مكافحة حشرات بالخبر عن توفير افضل الخدمات في ابادة ومكافحة الحشرات بجميع انواعها علي ايدي فريق متخصص . احصل الان علي خدمات تنظيف موكيت بمكة وبأقل الاسعار حيث اننا فريق متميز وذو خبرة يعمل باحدث المواد الفعاله في تنظيف موكيت بالبخار بمكة ويمكنها التخلص من جميع البقع والاوساخ المتراكمه عن طريق تنظيف سجاد بمكة للتأكد من ازالة اي بقع بكل سهولة من خلال تنظيف سجاد بالبخار بمكة علي ايدي فريق متخصص ومدرب علي ذلك . Fireball meteor over Washington State. Asteroid 2017 OL1 passes the Earth. Worker killed at Arizona copper mine. Summer storm injures ten in Istanbul. Asteroid 2017 MB1 passes the Earth. Asteroid 2017 NS5 passes the Earth. Sinkhole swallows car in El Paso, Texas. 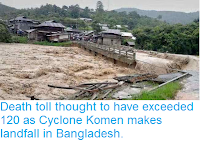 Flooding kills at least seventy three in Assam. Sinkhole swallows bus in Veracruz, Mexico. Asteroid 2017 MC1 passes the Earth. Eleven confirmed deaths in Japan landslides. Sinkhole swallows car in St Loius, Missouri. German tourist found dead on Sumatran volacno.